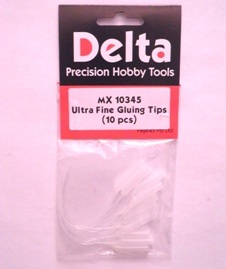 This pack contains 10 x Ultra Fine Gluing Tips. This item attaches to a glue tube, the 7cm long, ultra fine tube gives you the control to lay down a neat, thin line of cement, in hard to reach spots. There is currently 12 of this item in stock. This item was added to our catalog on Saturday 01 August, 2015.